Applicable for all Digital Oscilloscopes or ScopeCorders. With increases in the speed of measured signals in recent years, it has become necessary to make floating measurements over a wide frequency band. 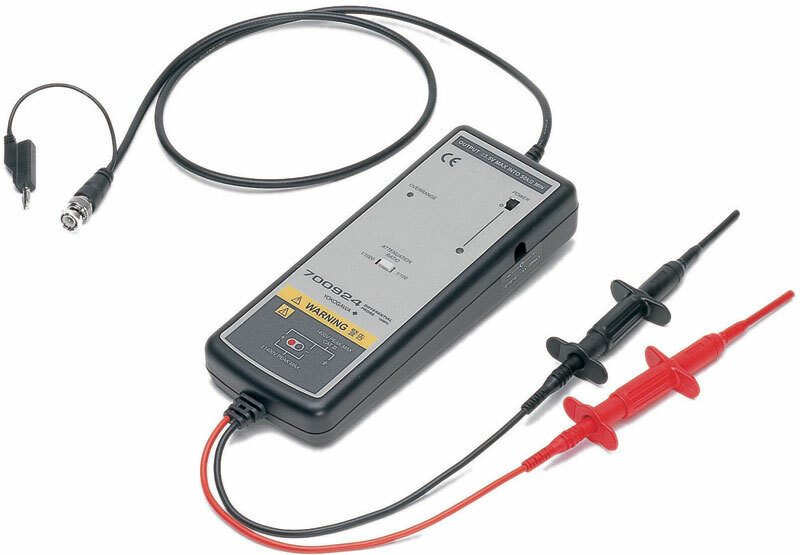 The 700924 differential probe lets you make wide-band (100 MHz) differential input measurements by just connecting the probe to the input of a single-end input digital oscilloscope. Oscilloscope input amplifiers are normally single-ended. They do not provide accurate measurements when used in combination with a 10:1 passive probe for measuring the gate-to-source voltage of a switching power supply, or potential difference with a common mode voltage in elements such as Insulated Gate Bipolar Transistors (IGBTs). Furthermore, there is a risk that current will enter through the oscilloscope ground line and damage the oscilloscope. ¹: 38 mm is listed as the maximum value. Note: Dry cells and AC/DC adapter not included. Each 700924 differential probe comes standard with red and black pincher tips (one each).